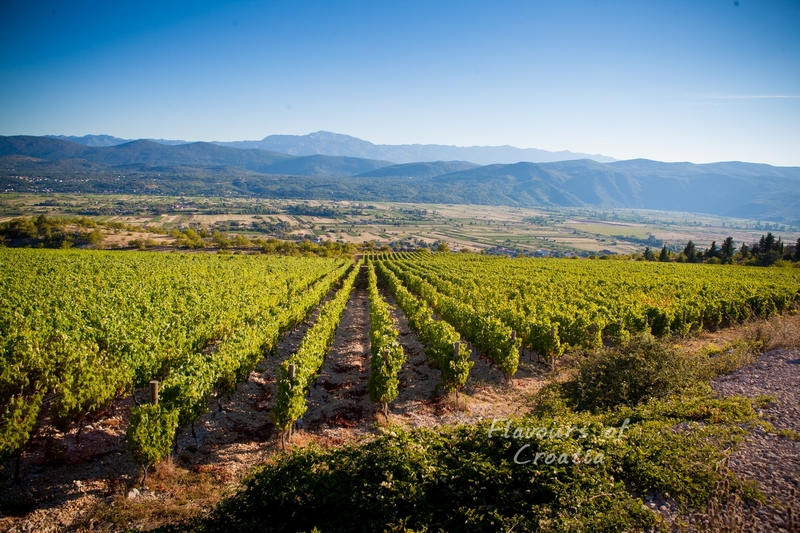 We’ve long enjoyed Croatian wine – a pretty well kept secret in our view – so we decided to showcase Imotski, an area not far from Split and well known for its fine wine. We gathered in Split in the rain and cold in late November 2017 – a few of the Gecko Tours team and some friends… The blog pictures included here are a combination of pictures of the day (somewhat darker) and some pictures of the tour in Summer (somewhat sunnier!). Undeterred by the inclement weather we headed to Imotski, a town which dates back to the 9th century having been part of the Ottoman Empire under Turkish rule, the Venetian empire and more recently part of the Austro Hungarian Empire. Arriving in Imotski, after a little more than an hours journey from Split (WiFi on the bus was good so I could write some emails) we are shown the Imotski Blue lake through a wonderful leafy park. The Blue Lake is a deep sinkhole formed by the collapse of the roof over a huge underground cave. The cave was formed by water through millions of years, and it collapsed about 5 million years ago. Erosion and earth quakes have formed the sides of the lake so it is now possible to walk on a path all the way down the 220 meter deep sides. In fact, it’s not blue at all today, it’s waterless, as it is unusually dry at the moment – we are told this occurs about once every ten years. On these rare occasions, the Imoskian’s arrange a football game between local teams and the only thing that is always assured – the result must be a draw – better than losing I guess! 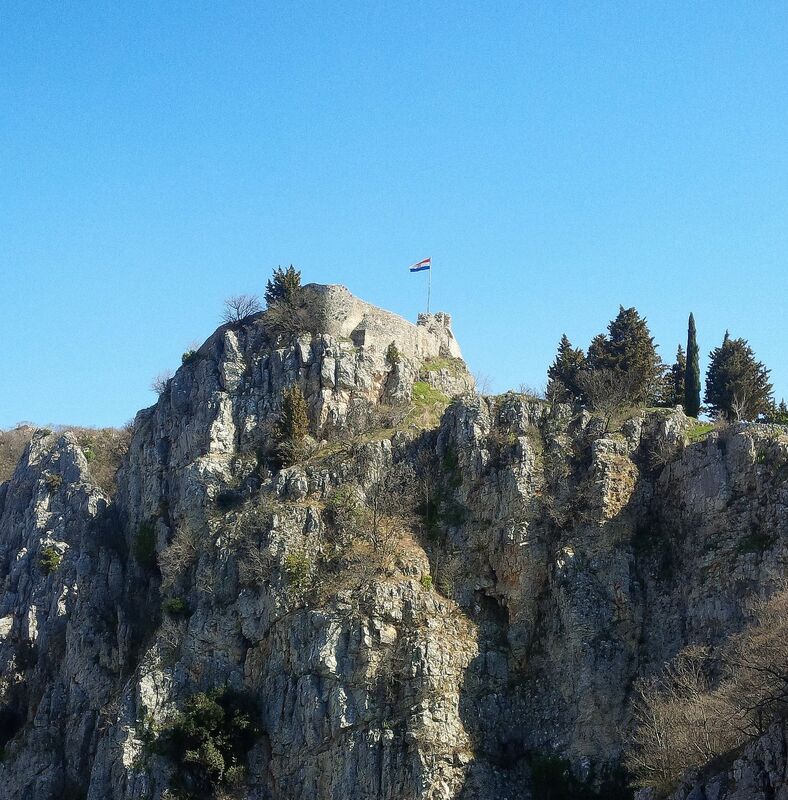 Then we’re off to the Imotski fort – high above the town and the Blue Lake, towers Fort Topana built by a Croatian duke in the 9th century. It played an important part in the Ottoman occupation from 1493 to 1717. The views of the plain below are spectacular. 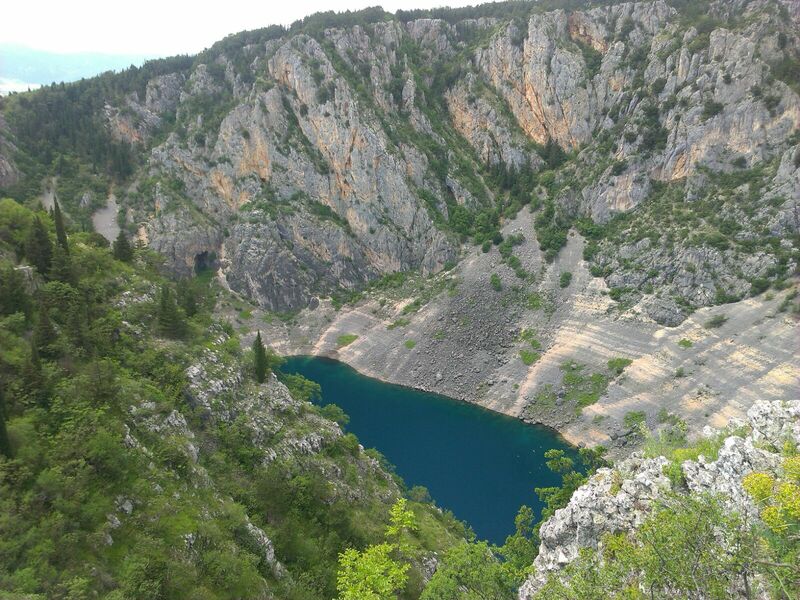 En route to the Grabovac winery we call in on the Imotski Red lake – the lake is named after the red cliffs that form its walls. The total depth of this hole is 522 meters, and it drains out in a strong underground river of unknown origin and destination. In the lake lives a fish that is unique to the red cave. It was named Delminichthys adspersus as late as 1843 – it’s a small sardine looking fish of 9 to 12 cm. We are told that several allied aircraft crashed into the cliffs above the lake during a bombing run in support of Tito’s partisans in 1944 and were eventually cleaned out after the war, though parts of the plane remain in the lake today. 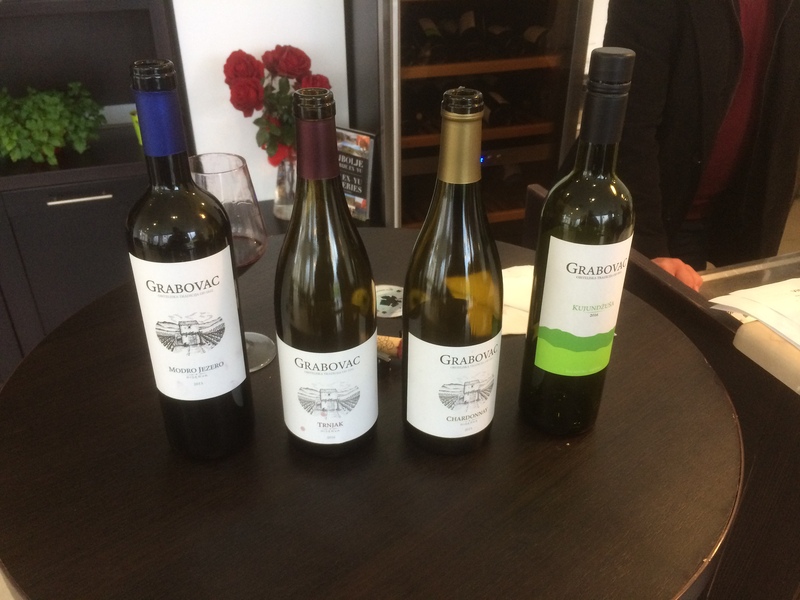 We are met on the slopes of the vineyard by none other than Mr Grabovac senior himself who was one of the very first people, post the abolition of Yugoslavia in 1990, to set up a private vineyard. 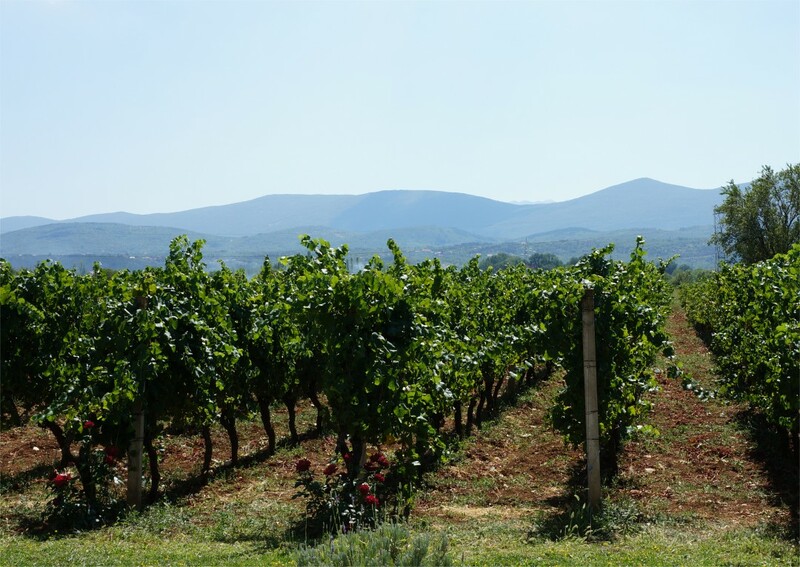 He explains that no fertilisers are used in the production of their grapes and the natural slope of the land provides perfect drainage for the production of high quality grapes. It’s pouring down so we head for the main building, set amongst the vineyards, where we are welcomed into the reception lounge where plates of locally produced goats cheese, home made donuts (they grow their own wheat) and of course a selection of local grappa are provided. 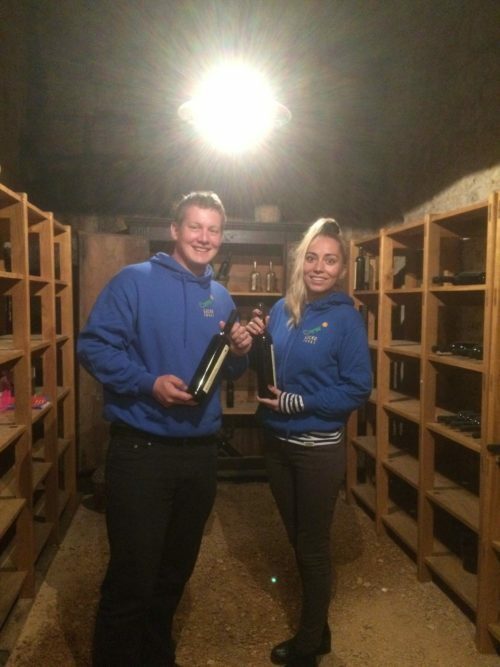 To get us in the mood we try a glass of their superb sparkling wine. 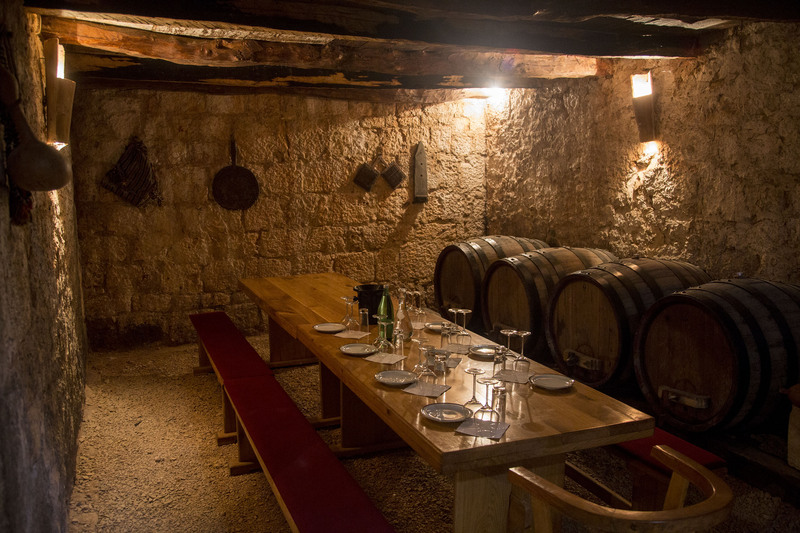 Then we are whisked down into the deep wine cellar where his son, Nikola Grabovac, educated in France and Germany runs through their production methods with an encyclopaedic knowledge of viticulture, all presented in perfect English. 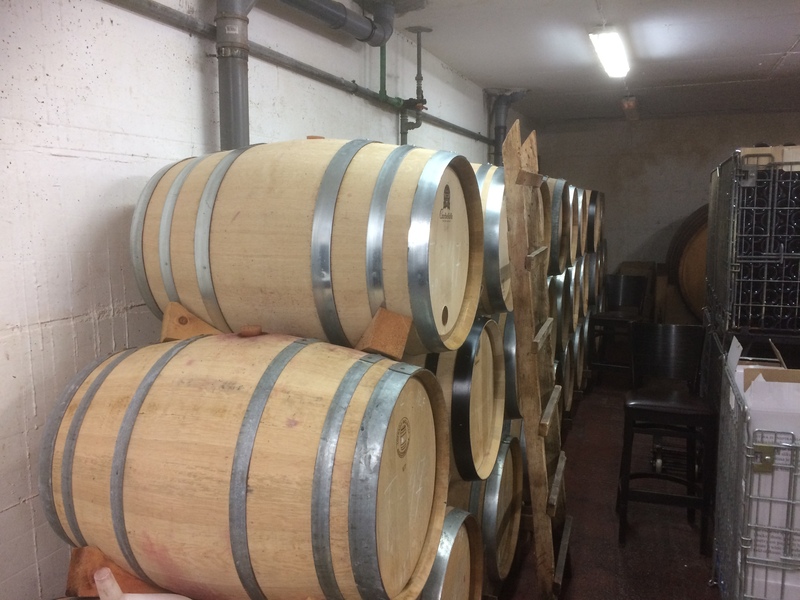 Fascinating, we learn about the various phases of wine production, the importance and sourcing of the oak barrels (and their very high cost! ), their very limited use of sulphides, the origin of specialist local grapes etc. All very informative but all that education has created a thirst. 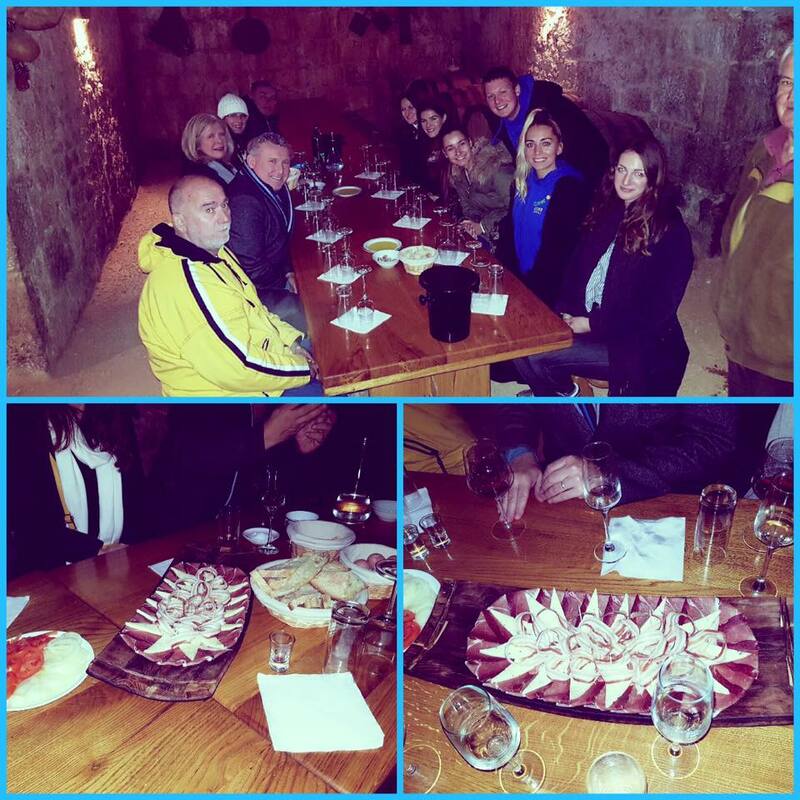 We are treated to a wonderful wine tasting session, all accompanied by their local cheeses, hams and olives. 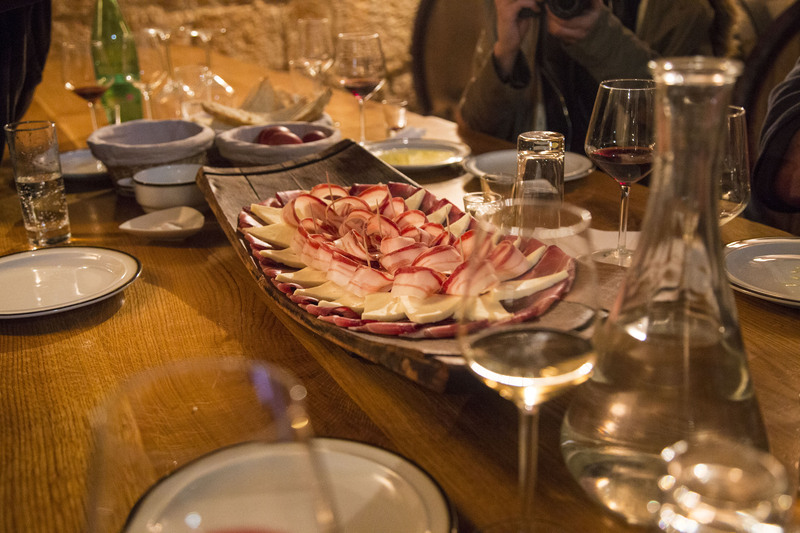 We try Kujundžuša, light white ideal with cheese, oak aged Chardonnay, the medium bodied and very flavoursome red Trnjak, and the full bodied Modro jezero, ideal with red meat and dark chocolate. For each (and with some assistance from Nikola) noting the colour, legs, nose and acidity!! We debate the various taste associations and what food would best accompany each wine and have quite a laugh in doing so – I’m becoming an expert!!! 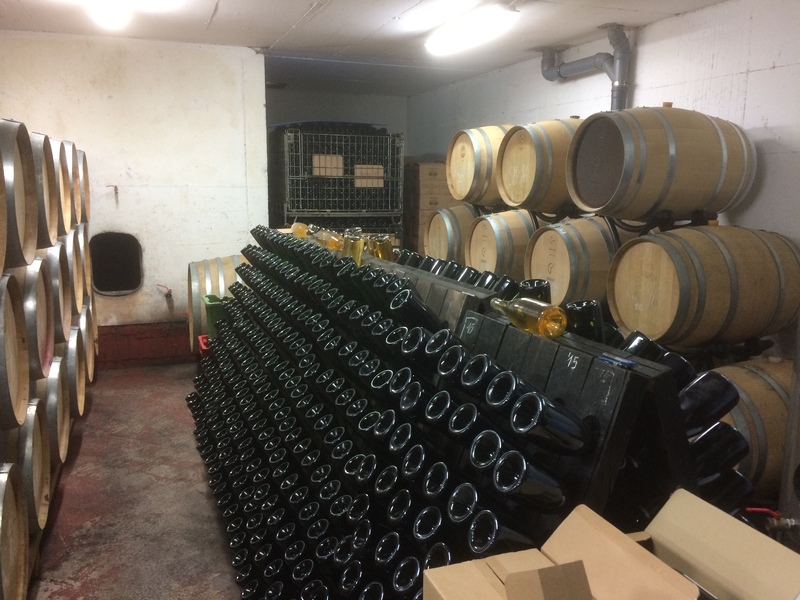 I particularly enjoyed the Trnjak, so I buy a case (reasonably priced at about £8 a bottle) and feeling a little light headed we’re off for our second wine tasting session at the nearby Jagul wine cellar. 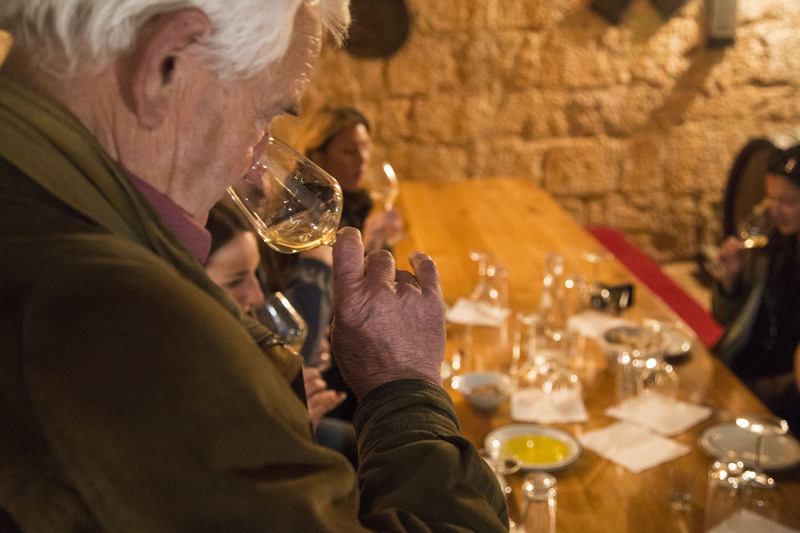 We are greeted by the vintner, a wine enthusiast who had worked much of his life in Germany but who had returned to his home of Imotski some years back and set up his own vineyard and cellars. 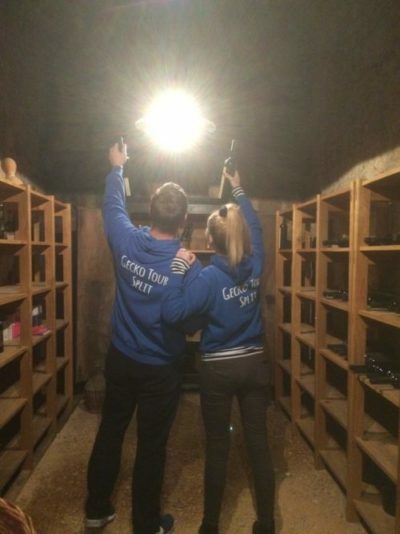 His enthusiasm is infectious and his cavernous cellars, consisting of 5 faults and littered with old oak wine barrels, incredibly atmospheric. On a hot summer’s day this would be such a welcome respite from the heat but today that’s not providing any benefit to us in the cold!!! The house dates back to 1893, the cellar was cleared recently and the various period artefacts found during the excavation adorn the walls. 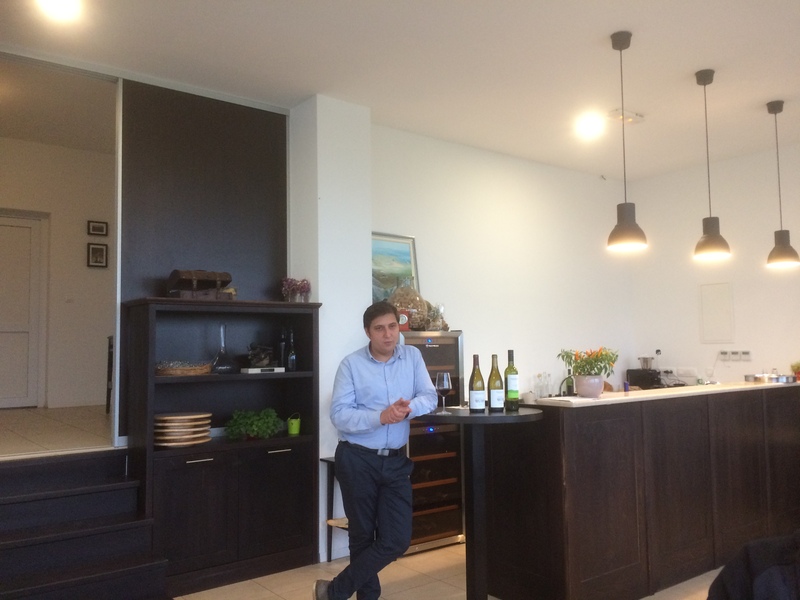 He uses traditional wine making techniques which he explains with passion. Then we are treated to a seemingly endless supply of fritule (sweet homemade pastries pronounced “fritula”), a selection of grappa (of course! ), olives, homemade bread (delicious), hams, cheeses and of course a selection of his wines, all carefully explained to us during our tasting. It’s time to go back to Split – we clamber onto the bus and within a few minutes, most of us are fast asleep. I have no idea why we are overcome with such somnolence but what a day – highly recommended for those of you who enjoy wine, are interested in how it comes about and fancy a look at authentic Croatian life outside the main cities and away (though only about an hour) from the hustle and bustle of tourism in Split. Gecko Tours Split provide this small group tour from its base in Split though we can arrange pick up/drop off from Makarska for those who prefer this.